A picture collage, made on black chart paper (card sheet), using very basic scrap-booking techniques, as a part of the wedding gift for a very close friend. The collage features Namrata (the happy girl-in-pink in the very center), surrounded by handpicked photographs of the group of friends who gave this gift to her. 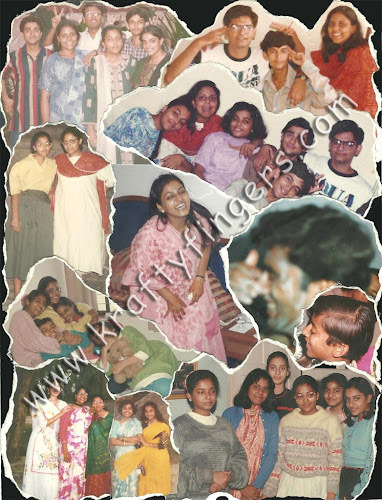 These photographs, spanning through several years, were specially chosen to mark all the important events during the life of this group... the most treasured memories of the group. This gift was meant to serve as a memorabilia for this special friend, who was about to begin a new chapter in her life. It meant to signify that her old friends will always be there to support her, even if just in spirit. This product was made-to-order as a very special gift for someone.